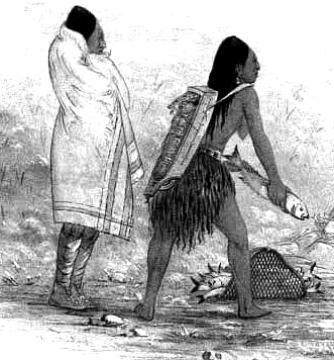 Summary and Definition: The Clatsop tribe were amongst the Native American Indians who changed the shape of their heads to a flat, elongated shape and nicknamed 'Flatheads' by the white traders. The Clatsop tribe were amongst the Native Indians encountered by the Lewis and Clark expedition in 1805. The Clatsop were highly skilled fishers and traders who were located along the Columbia River to the Pacific Ocean and lived in plankhouses. The Clatsop tribe were an important Native American Indian people who controlled the mouth of the southern mouth of the Columbia river. The Clatsop people were organized into settlements, rather than tribes. Many of the Northwest Native Indians who used tattoos to decorate their skins and re-shaped their heads according to the customs and traditions of their people. This drastic change in their appearance led to the nickname of 'Flatheads'. Refer to the Flathead article to learn more about their lifestyle and method of creating the flat, elongated shape of their heads. As can be seen by the following map the Clatsop tribe lived in close proximity to many other Native Indian tribes. There lifestyle was similar with their neighbors and details of the types of clothes they wore, their religion, the food they ate, their plankhouses and their canoes. For details of their lifestyle refer to the Chinook Tribe. The Clatsop tribe were great fish-eaters, and believed that the salmon were a divine gift from the wolf-spirit Talapus. The wolf-spirit Talapus was believed to have created the salmon to save their people from extinction at a legendary time of near disaster. The Clatsop tribe celebrated the 'First Salmon feast' which honored the salmon. Where did the Clatsop tribe live? The Clatsop are people of the Northwest Coast Native American cultural group who lived in plankhouses. The location of their tribal homelands were around the modern day Oregon areas of Astoria, Gearhart, Seaside, or Cannon Beach. The geography of the region in which they lived dictated the lifestyle and culture of the Clatsop tribe. The location of their villages were along the south side of the Columbia River, north of Neakahnie Mountain. The Lewis and Clark expedition made contact with the Clatsop tribe in 1805. The following article, Journals of Lewis and Clark: Clatsop Native Indians, provides details of their encounters with these Native American Indians. The expedition named their last encampment, Fort Clatsop, after the tribe after friendly meetings with Coboway, chief of one of the Clatsop villages. Who were the most famous leaders and chiefs of the Clatsop tribe? The most famous leaders and chiefs of the Clatsop tribe included Chief Coboway. At least 14 Clatsop villages are known to have existed in the region. The largest village, Quatat, stood at the mouth of the Necanicum River. Clatsop History: What happened to the Clatsop tribe? The modern day Clatsop people has no formal recognition today but its members form an unofficial confederation called the Clatsop-Nehalem Confederated Tribes of Oregon, with the Salishan-speaking Nehalem (Tillamook) tribe that once inhabited the area around Tillamook Bay.